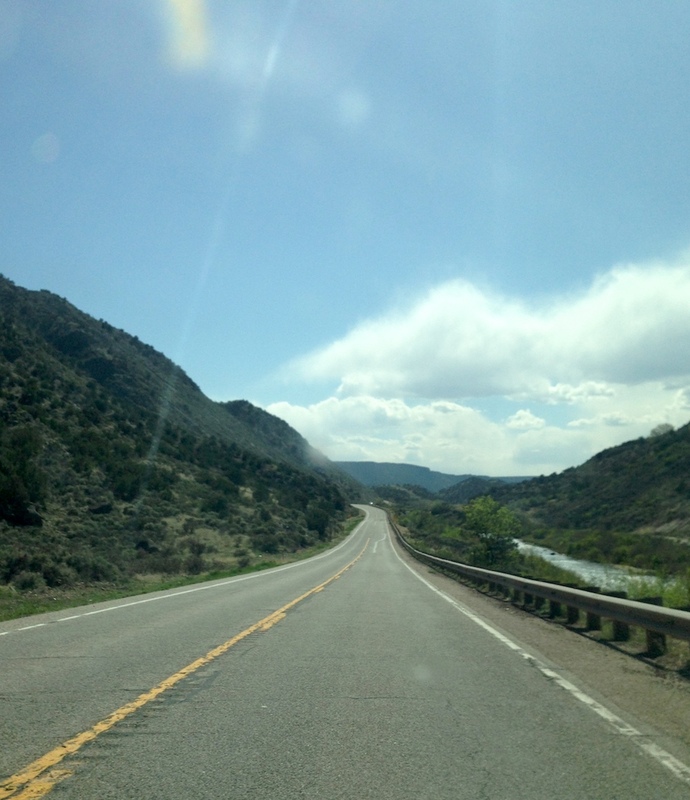 To ride Highway 68 between Velarde and Taos? Uh, not so much. Every time I drive it, I think, “Damn, this would be a fun ride.” And then I remember how people who are not me drive that stretch of highway, and I reconsider. I’ve ridden bits and pieces of it, but that was decades ago, when I was young and fearless instead of aged and querulous. Likewise I’ve done some of the High Road to Taos, but never the entire ride. MD, Khal and I have been talking in comments about giving the High Road a go sometime in June. Anyone else interested? Give us your thoughts in comments. Also your name, favorite color, and the air-speed velocity of an unladen swallow. This entry was posted on April 26, 2015 at 11:20 am and is filed under Bicycle travel. You can follow any responses to this entry through the RSS 2.0 feed. You can leave a response, or trackback from your own site. Yeah, the idea of riding NM 68 gives me The Fear. I’ve read too many stories about people meeting their maker on that road, and drive it with white knuckles. High Road makes more sense. Would this be a boys only trip? I would be interested if I can make the details work for a trip to New Mexico. I should have my new touring bike that would work for this trip soon. Just not sure if I ride your pace on the hills. We don’t have huge ones around here. I can ride flat/smaller hills 80-100 miles a day solo at about 15 – 16 mph, faster in a group. Just not sure about the hill climbing. Let me know what you guys come up with and let me give it serious thought, if girls are allowed. Well if girls aren’t allowed then they just lost their ride leader, haha. 😉 Be glad to have you along. Girls are always welcome, especially ones who can ride 80-100 miles per diem at 15-16 mph. The question is: Can the boys hang with ’em? Gasp…..ugh..where is my bungee cord? Pat O’Brien, screaming yellow, and is the swallow climbing or descending? 80-100 miles a day at 15 or 16 mph? Hey Khal, can I borrow your tandem? Sharon can be the cap’n and I will stoke. I would be glad to ride with this group of attractive, buffed, intelligent, and compassionate cyclists. Just polishinng the apple early in case I end up sucking wheels all day. I’m up for 40-50 miles at 12 or 13 mph in rolling terrain. Will that do? Seriously. I have to go to Illinois for a nephew’s wedding 25 to 30 June. Free the rest right now, and 2 June is my 66th birthday, just in case we need a reason for the ride. By the way, what is the exact route? Pat–Our tandem is a “small” as Co-Motion measures it. Probably fine for someone up to five foot eight or nine in front and slightly smaller in back. Meena is 5’5″ and fits the stoker position nicely. I’m 5’6″ and the bike is a good fit, but if it was any taller I would have to be careful of not singing soprano on unannounced dismounts. But if that works, sure you can borrow it. We might have to experiment with stem lengths but those are easy. I think I have a few spares. I don’t go up the hills as fast as I used to, and I was never exactly Marco Pantani, though we shared a certain piratical fashion sense. Around here I mostly ride rollers. Can’t say as I’ve done a real sustained road climb in the better part of quite some time, unless you count the gradual rise from the bosque to Rancho Pendejo, which is 800-some-odd feet. Not insignificant, but hardly of Chimayo-to-Truchas caliber. That sumbitch hurt me when I was a 160-pound 30-something. I haven’t ridden a tandem since I was a teenager and an evil companion stole one from somewhere. Anyway, I’m afraid to turn my back on Herself. We’ve all got it coming, especially me, and we never know just when we’ll get it. I have to say that a tandem is a test of a marriage. If a couple can ride a tandem for 21 years, as we have, you can probably survive most things. Well….maybe. That depends on if the group wants to ride all the way to Taos, with the potential of an overnight there. If there are folks coming from out of state I think taking the time to overnight in worth it. The real adventurous sorts could ride back the next day. There might be some local spouses of riders who could be sag support and drive everyone back. Also the RTD runs an express bus between Taos and SF on Saturdays and Sundays for cheap. The other option is a ride up to Truchas and back. That’s just under 50 round trip depending on start location. I agree with MD. Especially for out-of-staters, it would be worth it to overnight in Taos. Being clinically insane, I’m trying to decide whether I might like to press on from Taos and ride to Bibleburg. That will take some thought. Also, training. I seem to be capable of the occasional steady-state half-century, but there’s plenty of climbing between Rancho Pendejo and Chez Dog. Sandy will be coming but not riding this time. She said she can SAG us. We have room for two bikes on back rack and 1 or 2 in the van (Toyota Sienna.) We would also be up for an overnight in Taos. If we start from Santa Fe and go to Taos the google mappy thingy says about 75 miles. That is pushing for me. If we started from Pojaque to Taos, that is about 58 miles. The Truchas out and back sounds good. especially if we go in and look around the village. I assume a touring bike would be a good choice. Looks like all we need to do is dial in some dates. In theory, I work weekends; in practice, I can arrange for time off in any month that doesn’t have a grand tour in it. So make it easy on yourselves, all you folks who need to travel from outside the Great State of Breakingbadistan. I might be able to coerce Herself into driving sag, too. My Forester has a two-bike roof rack and we could stuff a third in the way-back. I might have a trailer hitch on the bugger by June, too, and thus we could accommodate a couple more two-wheelers. Finally, friends and friends of friends have getaways in Taos. It’s entirely possible that I might be able to arrange free/low-cost lodgings. The second half of the month is best for me if I can work out all of the other logistics. Going to try to find friends to stay at on the drive over to New Mexico and back to save on hotels.The ideal dates would be any combo from June 23 to 30. It is quite a haul from Santa Fe. A local group I sometimes ride with has done a 3 day tour for a number of years. Day 1 is SF to Taos, Day 2 Taos to Las Vegas (NM not NV) and Day 3 Las Vegas back to SF. Occasionally it’s been done in the opposite direction. I would say that for folks not used to a lot of miles, a lot of climbing and or the altitude that a start in Pojoaque is best. There really isn’t much to see in Truchas. You can ride through the main part in 5 minutes. There is a small general store that has been open only about 1/3 rd of the time I have ridden up there. The High Road is beautiful, but remote. It winds through a lot of small hamlets, but the only place along the route that I am confident would have a store open for at least water and a Snickers bar is Penasco. There is a nice little restaurant there called Sugar Nymphs, but I haven’t seen the schedule lately. Depending on our final destination in Taos, figure on 60 miles with nearly 6,000′ of climbing at elevations between 6,000 and 9,000′. Bring an oxygen tank. And a camera. My only bad weekends are Memorial Day weekend and last weekend in June, due to prior commitments. A triple on the front and a mountain bike pie plate on the rear, hallowed be thy names. See Sharon, those touring bike gears are just the ticket. We may be slow, but we’re geared low, and will make anyway. We have June 1st through the 22nd open. I know, that also surprised us. Are we spending the night in Taos or returning to Santa Fe for a second night? Will Taos allow two Irishman in town at the same time? Is that you, Jerry Merkey? Darn. More warning guys. I am doing a tour of the Driftless area in MN end of June and a ACA tour of the Adirondacks end of July first week of August. Then maybe a reprise of Pittsburgh to DC in September. Drove the high road a couple of years ago and loved it. Doing it by touring bike would be a kick.